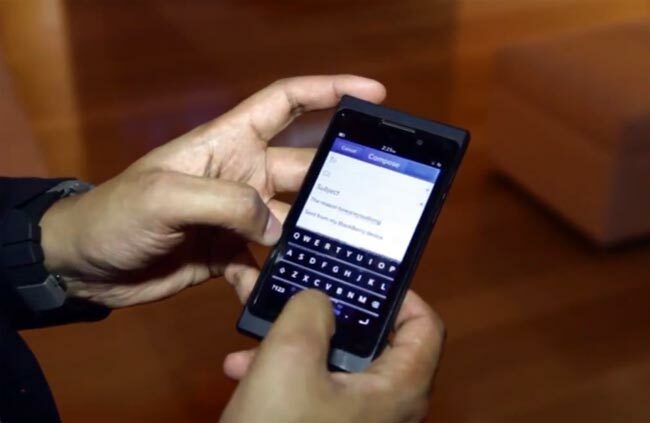 Kabir News Tech Can the BlackBerry Z10 Hold It’s Own Against SmartPhone Titans? Can the BlackBerry Z10 Hold It’s Own Against SmartPhone Titans? BlackBerry has previously taken on the touchscreen approach with their Storm, Torch, and PlayBook. Now enter the BlackBerry Z10 which could be on even footing with Apple, Google, HTC, and Samsung when it comes down to features and specs. Does it match up where it comes to being marketable? Let’s check out the Z10 and see what’s under the hood. While a minor thing to touch on, the Z10 features a build to fit in the smartphone market. While it’s kind of a homogenous structure to accommodate the touch screen, it does appear to actually belong in the mix of the iPhone, Galaxy, HTC, and so on. The BlackBerry Z10 is a bit heavier than its immediate competitors the iPhone 5 and Samsung Galaxy S3 and will probably be heavier than the Samsung Galaxy S4. The BlackBerry Z10 delivers an LCD display with a resolution of 1280 x 768 pixels and 356ppi. The screen itself is 4.2”. Where the Z10 becomes similar to other phones in the industry is the 8 megapixel rear camera, but also features a 2 megapixel camera which is a bit larger than iPhone 5’s 1.2 megapixels and Galaxy S III’s 1.9. It is comparable to the Galaxy S4’s front facing camera which is 2 megapixels, but falls short of the rear camera which comes in at 13 megapixels. The power of the Z10 is 1.5GHz dual-core Qualcomm Snapdragon S4 and allows for LTE. It is able to support up to 802.1 when it comes to wi-fi. In contrast to iPhone’s 1800mAh non-removable battery, the Z10’s is a removable 1800mAh, but doesn’t compete to the Galaxy S III or Galaxy S4’s batteries both of which are removable. The other smartphones sell their models in storage sizes of 16GB, 32GB, and 64GB internal capacity whereas the Galaxy S III and S4 go from 16GB to a maximum of 64GB with Galaxy S III featuring a microSD slot. The BlackBerry Z10 comes with 16GB out of the gate and a microSD which allows up to 32GB. The BlackBerry Z10 allows for pretty solid navigation out of the box once the phone has been turned on. If you’ve used smartphones before, then getting around the Z10 will be second nature. For those new to using smartphones there’s said to be a very detailed tutorial wizard that will help you get around. Other than that, you’ll main use swiping and voice commands to get around the functions. Voice commands are especially effect when it comes to the search function for the BlackBerry Z10. The two key features for the Z10 you’ll notice as soon you turn the smartphone on are the Active Frames and The Hub. With the Z10, the BlackBerry has also improved the OS greatly. To start, it features Active Frames which will look very familiar if you’ve used Windows 8. The titular frames are similar to the live tiles in that OS. You will be able to have as many frames as you feel you need and you’re able to swipe through them easily. The star feature of the two is the universal inbox called The Hub. All messages—text messages, notes, emails, social media, and so on—head here. The Hub allows you to check out the contents while operating a task or using an app. A gesture—swiping up and to the right—will allow for you to open the Hub to full screen. The Hub also features BlackBerry Flow which allows for you to see events and meeting for the rest of day. This allows for you to tap on the day and see contacts involved in the event. There’s also a QWERTY touchscreen keyboard. The setup of the keys is wider and features a space so that you won’t end up pressing one of the nearby keys by accident. It’s great for those us with large fingers who have trouble with the keys. Voice commands are something that is pretty common in smartphones now and days. You’re able to tell the Z10 what you wish to compose via holding the microphone icon or the pause button on the side. Web browsing is better than it was on prior BlackBerry versions. The BlackBerry Browser loads pages rapidly. The touchscreen works extremely well with the browser and navigates smoothly. The BlackBerry Browser is based on HTML 5, but still allows for Flash which must be enabled when you go to a site which supports it. All other essentials of a browser are here such as a bookmarking, adding stuff to the home screen, and so on. Apparently the BlackBerry Browser works seamless with 3G wireless and wi-fi. So how does the BlackBerry Z10 hold up against the Samsung Galaxy S III and the iPhone 5? It is more than able to hold its own and if released a bit earlier could’ve probably competed well with those two. However with the HTC One out and the Galaxy S4 soon to enter the market, the BlackBerry Z10 would have some stiffer competition. The BlackBerry Z10 is definitely no slouch against those two, but it really shines when put against the two phones that it would compete with directly. Consider the BlackBerry Z10 as a viable smartphone worth picking up. It’s a bit on the late side when it comes to be a current smartphone of the likes of iPhone 5, HTC One, and the Samsung Galaxy S4.